Despite a range of finishes, taps' functionality is quite simple: one half is plumbed into the cold water supply, the other half is plumbed into the hot water supply, and a central spout connects the lines together so you can regulate the temperature of the water flowing into your sink. Unless, of course, your kitchen faucet is for hot water only. Which tap type to choose? Before you go buying any kitchen faucet, it’s handy to know the different types that are out there, as some may not be compatible with your kitchen sink. If you’re looking at purchasing a deck mounted faucet, you’ll need to bear in mind the number of holes in your kitchen sink. While some taps have one central connection (monobloc), others may require one for hot and one for cold water, in addition to the main spout, equating to three separate holes. It’s also worth considering that a kitchen faucet doesn’t necessarily need to attach to the sink. Faucets can also fix onto your countertop, giving you more leeway when it comes to deciding on the style of kitchen sink you would like in your kitchen, as you won’t be limited by the amount of holes it features. This tap not only makes it easy for you to install, it makes it easy for you to adjust pressure and temperature, too, due to its lever style control. Suitable for both low and high pressure water supply, this kitchen faucet is a safe all-rounder, and thanks to its curved neck, linear lever and gleaming chrome finish, it is subtly modern, making it the perfect choice for the everyday kitchen. Brushed nickel provides a classy, elegant finish, and it doesn’t show up water marks as much as chrome. With two levers instead of one, you have greater control over the pressure and the temperature of the water. Thanks to its aerator, the volume of water is decreased, which may lower the amount of water you use overall. If you like the two lever style but prefer the chrome finish, this tap is also available in chrome. 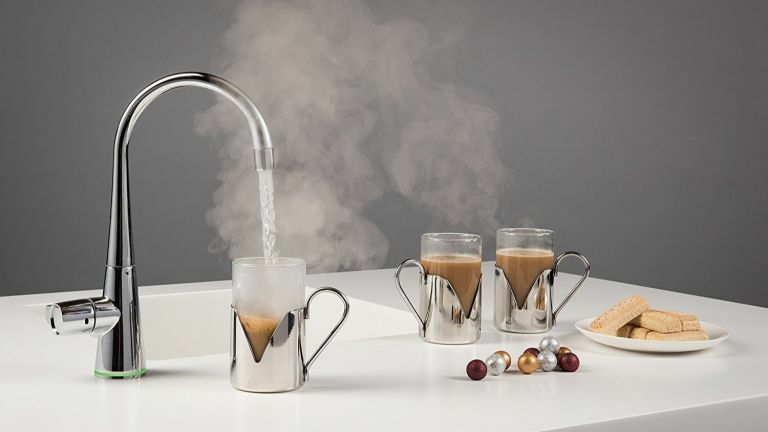 With its curved chrome finish, this hot water tap is the perfect choice if you’re looking for convenience when it comes to making a quick brew or giving the vegetables a head start on the boil. It requires the installation of the 3ltr hot water tank, but doesn’t necessarily need to be fitted next to your sink. Thanks to a pull out and turn safety lock, you shouldn’t need to worry about the tap being turned on unintentionally, however it’s worth considering that areas with hard water will require a filter to prevent it blocking up with limescale. Like the idea of this type of tap? Find more in our dedicated buyer's guide of the best hot water taps. If you’re looking to make your kitchen faucet a stand out feature, this selection from John Lewis will certainly give your kitchen an edge. Blending a gleaming chrome finish with matt black stainless steel, this tap is the ideal choice for contemporary kitchens. With a single spout and one installation hole required, this tap should be compatible with most kitchen sinks, just bear in mind that there’s a designer price tag attached. If you’re a lover of traditional country kitchen style and quality, this kitchen faucet is the perfect choice. Featuring timeless cross head handles, low lead brass and thick chrome plating, this designer kitchen faucet should stand the test of time. Requiring two holes instead of one, you’ll need to check the fittings on your kitchen sink or bear in mind fitting these taps may be slightly more complex than fitting a standard monobloc. Putting really grubby plates in the dishwasher can block it up, so having a station where you can quickly rinse the plates is a handy feature. Although designed with professional kitchens in mind, this tap is slight enough to not look out of place in a domestic kitchen, whether ultra-modern or Shaker-style. With a multi-spray pattern shower head, you can choose the spray power, and because it only requires one hole, it shouldn’t be too hard to fix the tap in place either, whether it’s sink or worktop.